Well maintained 1982 Robotron Classic. Can be shipped for additional charges, pick up or delivery can be arranged. 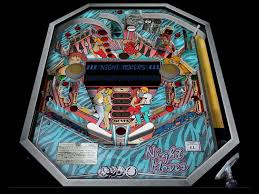 Well maintained 1982 Robotron Classic. Save the last human family and enjoy the serious gameplay from this high intensity super fun game. The best double joystick arcade game ever made. Own this one for your game room or add it to any collection. For its age, will be hard to find another in original excellent working condition. Description shows free shipping assuming pickup is being arranged. Can be shipped for additional charges, delivery can also be arranged.